What happened when I got stuck? So guys you know how we all tend to hate on Monday? How we’re stuck in an office or university or wherever it happens to be? Well on Monday 19th October I got stuck in a much more annoying location: the bathroom. But how did I end up getting stuck in there at all? Well the door handle to the bathroom had been quite a challenge for a few weeks. It wasn’t just us having door problems as recently another flat in the building had to get their front door changed as it just stopped working. That morning though my partner woke me up shouting as he was stuck inside and the only way to open it was from the outside. So later that day I tried to fix it but in doing so closed the door too far and got stuck at 10am. Getting stuck in a bathroom has many pros and of course a few cons too. 1. Unlike getting stuck in somewhere like a lift you can awkwardly try to get a drink from the tap. 2. You can open the window enough to get air and see more than the four walls surrounding you. 3. It gives you a chance to do those bathroom related chores you really hate doing. The bathroom has never sparkled so much in all the time we have lived here. 4. There is still phone and wifi signal so at least you can talk to people and get anything that needs doing (sending emails, making calls etc) done. 5. If you get really bored you can take a bath, have a nap in the bathtub, watch Netflix or catch up on your favourite beauty vloggers. 1. Cleaning the bathroom because you are stuck is good until you use too much bleach and the smell will not leave through the window quick enough and instead gets lodged in your nose. 2. It gives you a lot of time to think about life, the future and pretty much anything else that it is possible to pop into your head. 3. Whilst you have water available there is no food nearby. I went about trying to fix the door before getting something for my brunch (because nobody can afford breakfast and lunch these days). 4. There’s always that risk of somebody knocking on the door or pressing the doorbell and you not being able to communicate with them and them either walking away sadly or leaving you a grumpy note. 5. You end up using loads of products that are just hanging around because you have nothing else to do and your phone battery is slowly withering away. 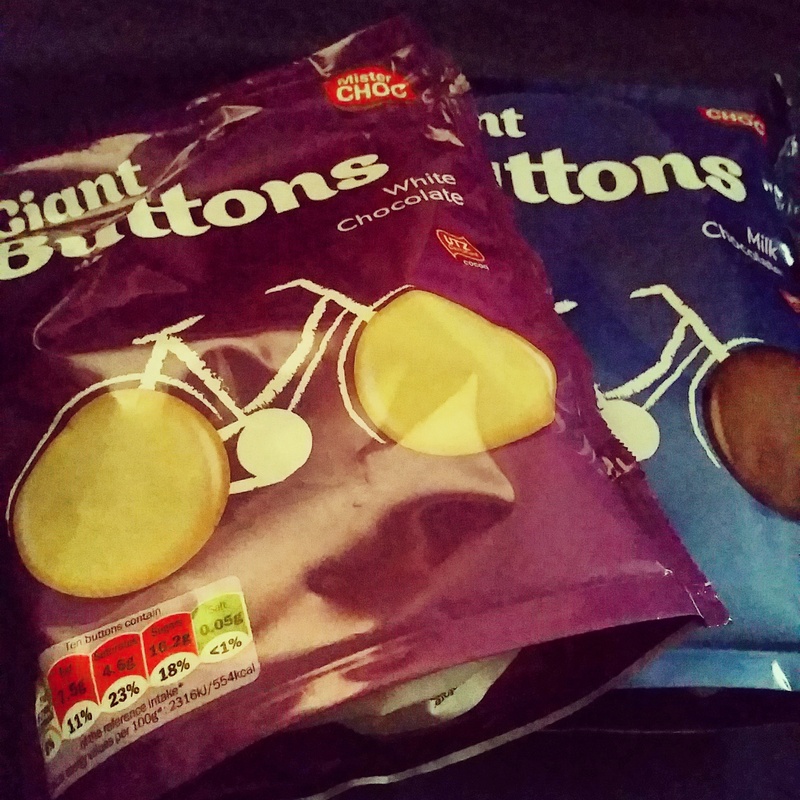 So what did I get up to during my ordeal? Well..
10-11.30am I tried to get out but as you can see from the picture above I tugged too hard and the handle came off, leaving the mechanism out of reach without a spanner and only the lock as a friend. After this I tried to see if I could get out the window and had to go about fixing it. By midday I had figured the window out but without a step-ladder to get out of the bathroom side I had no chance of escaping that way. There was no point in trying to fight this anymore. I had already hurt one finger by this point and shed a few distressed tears. I had tweeted at various points up until this stage and had communication with a few people offering comfort, advice and a chuckle. 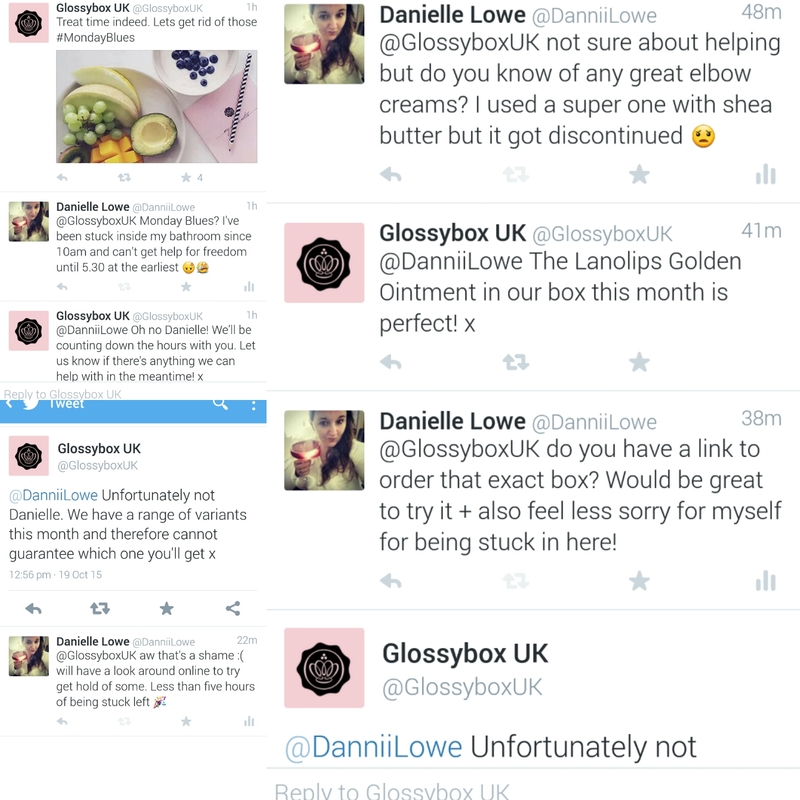 I even had a small chat with GlossBox about Monday Blues and used it as a chance to find out about suitable elbow creams. They came back with a suggestion but almost everywhere I checked online it was out of stock. Until about 1.30pm I managed to do various bits of cleaning but with the mop and sweeping brush outside the door it was still only half done but what was done sparkled fairly well after drying. For the afternoon I looked in the cabinet where I keep random bits and pieces and found a few things that I wanted to try out whilst nervously checking the time, my phone battery status and looking out for social media support. I got this box as part of a set last Christmas or maybe the Christmas before. My feet can be really challenging at times and need a lot of treatment so I thought I might as well give this a go and see if it did anything. 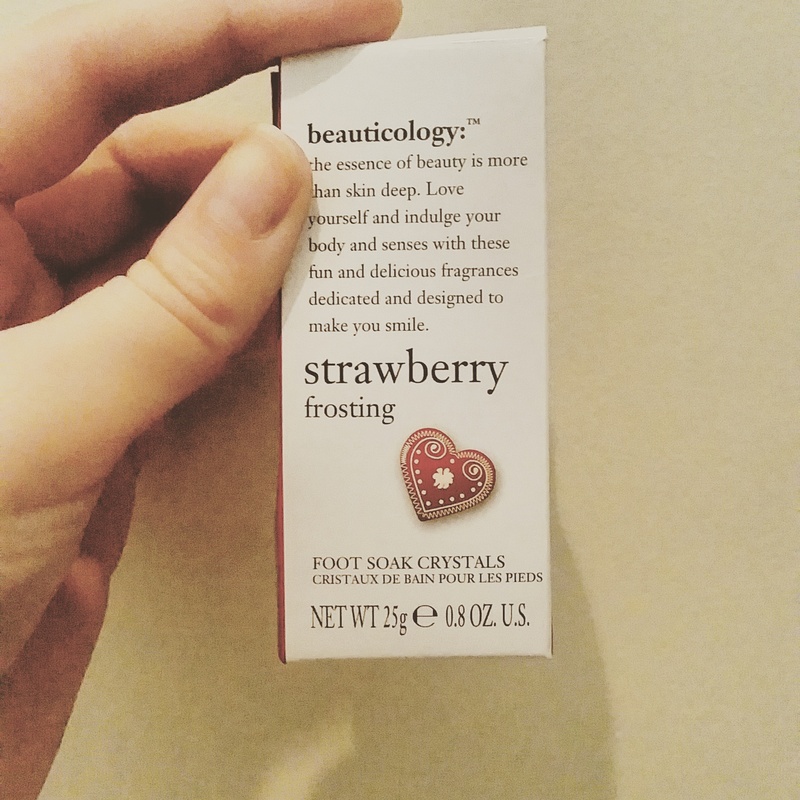 As they melted away they certainly had that whiff of artifical strawberry we have all got so used to from beauty products. But they didn’t seem to do anything more than warm water would do to the feet after 10 minutes or so which was disappointing but it passed a bit of time. These products have a really cute message and lovely packaging but they don’t deliver quite as you might hope and I know a few other people found this with various products in the range. They might be good to get a just teenager for Christmas if they’re still learning about everything beauty and you want to get them something cute and fun but otherwise try and avoid these products. And as this soak was being ineffective guess what happened? No there wasn’t a super human come to rescue me but instead the doorbell went. Royal Mail had already delivered the post that morning so I knew it wasn’t them. But I wasn’t expecting anybody or anything that probably wouldn’t come through Royal Mail so I was a bit confused and sad at being unable to get to the door. That encouraged me to make a breakout though. It was 2.30pm and I had been in there for over four hours with another four to go before my partner got home from work. I was starting to get the sort of shakes where you haven’t eaten in ages and your body is having a meltdown – I’m sure I’m not the only one that gets these. And I took the climb to get up and out the window and made it down fairly quickly. My right ankle and leg didn’t approve and I sort of hobbled back round to the front of the house. Luckily I had my house and flat keys in my pocket rather than being stuck outside shoeless and coatless for several hours. I looked in the post and there was a slip from UK Mail. I never get anything delivered to me from them so the mystery continued and I went about rescheduling it for the day afterwards. What the package actually was is for another post and a more cheerful day. After escaping the bathroom it was time to try to open it from the outside like we had managed in the past. There was no luck though. 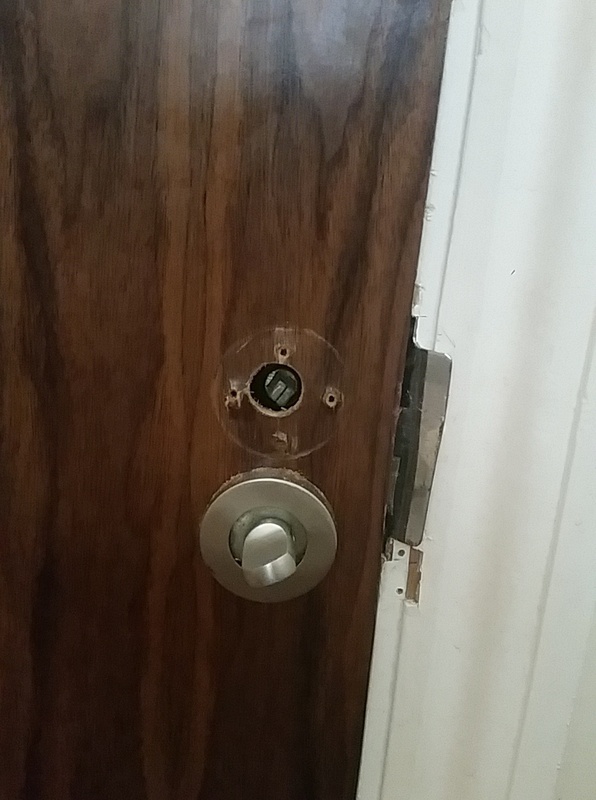 I was now locked out of the bathroom and away from the screwdriver and my glasses. There was no way the door was going to budge. I had lost my freedom to pee but gained the freedom to eat. It wasn’t until past 7pm that we got somebody to come to our aid to figure out a solution. This was after my partner had climbed back into the bathroom to see if he could figure it all out. We now have a half functioning door but the ability to walk freely in and out of my bathroom is brilliant and a luxury I have taken forgranted for 21 years.. although this was all less scary than the time I got stuck in a Haven swimming changing cubicle when I was eight or something. And guess how I relaxed from my trauma? By having a nice long soak in the bath. This entry was posted in Lifestyle and tagged bathroom, beauticology, boots, cleaning, climbing, door, flat, foot soak, house, lblogger, lbloggers, Lifestyle, lifestyle blogger, lifestyle bloggers, locks, panic, strawberry frosting, stuck, window. Bookmark the permalink. I can relate to that but mine ended with my dad kicking the door and as i was behind it i flew in to the bathtub, these days our door doesn’t lock anymore.